operated from the Swan Pottery in Tunstall, Stoke-on-Trent. They were noted for producing everyday tea service products and associated teawares. In the 1930s, the Lingard Pottery was producing "vignette" teapots with nursery rhyme themes, like Old Woman in a Shoe and Humpty Dumpty, many in colours of acid green and bright yellow. The Company made many fine novelty teapots in the period 1935-1955. 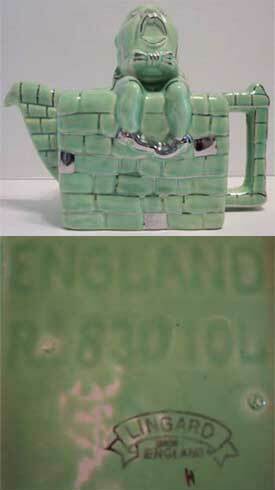 This Humpty-Dumpty Teapot is decorated in a vintage lime green color with silver leaf detail. Teapot is 7" tall x 8 1/2" long.